Location. 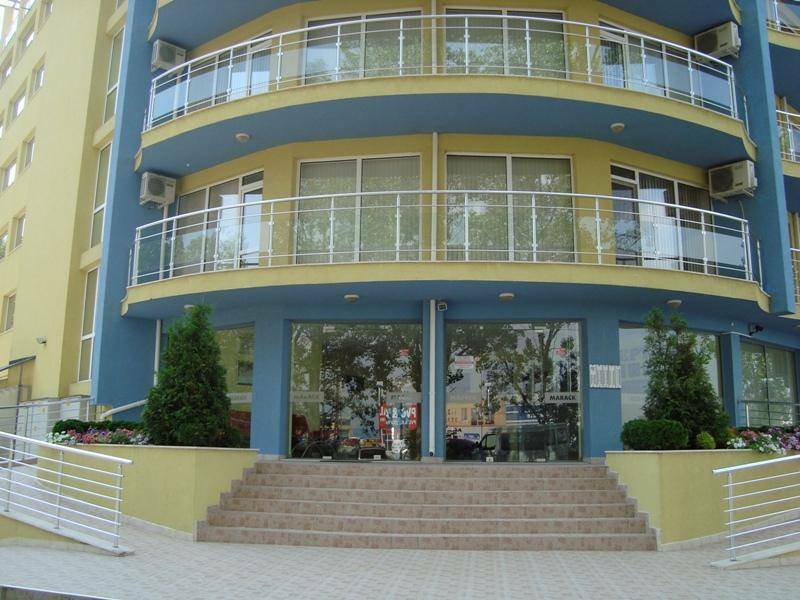 Aparthotel Marack is located in Sunny Beach, Bulgaria, 800 metres from the local beach and three kilometres from the ancient town of Nessebar. Hotel Features. 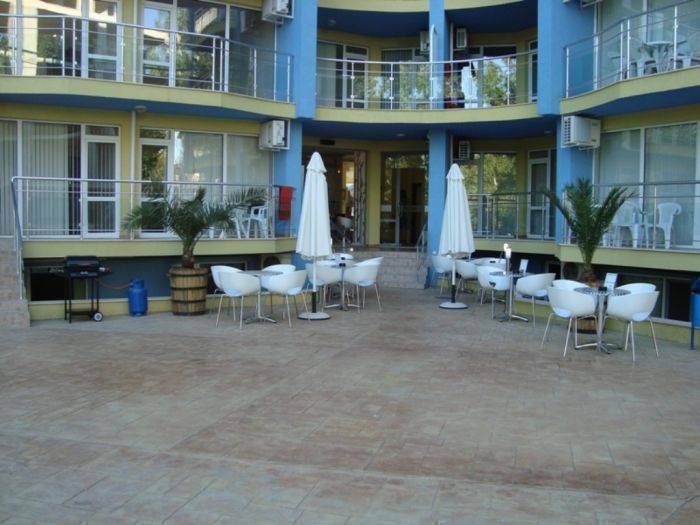 Aparthotel Marack is a modern complex comprised of two blocks of self-catering apartments. There is a bar and a cafe, and the hotel staff is available to answer queries at the 24-hour front desk. 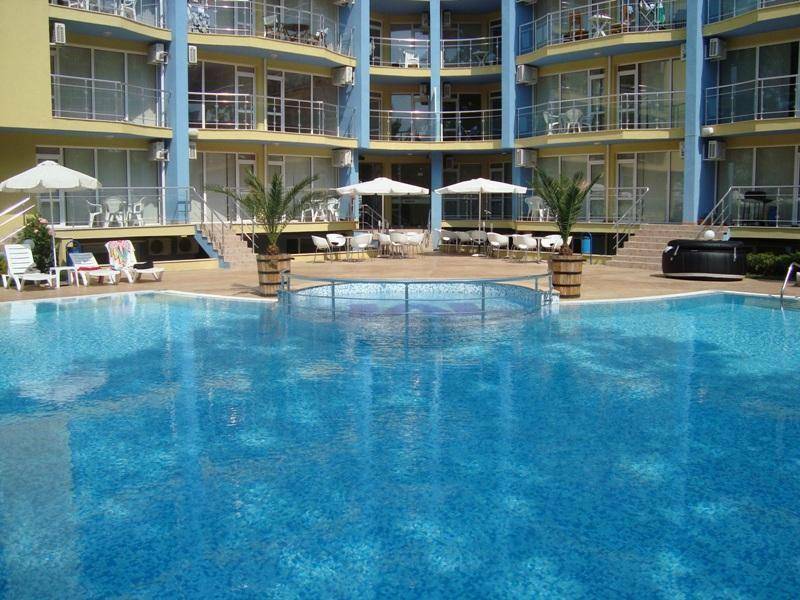 Aparthotel Marack offers a kids' pool and a separate pool for adults, and water sports facilities are available nearby at the beach. Further local recreational facilities include go-carting and paintball centres. Guestrooms. The 82 self-catering apartments are modern in style and feature fitted kitchens with refrigerators, cookware and microwaves. 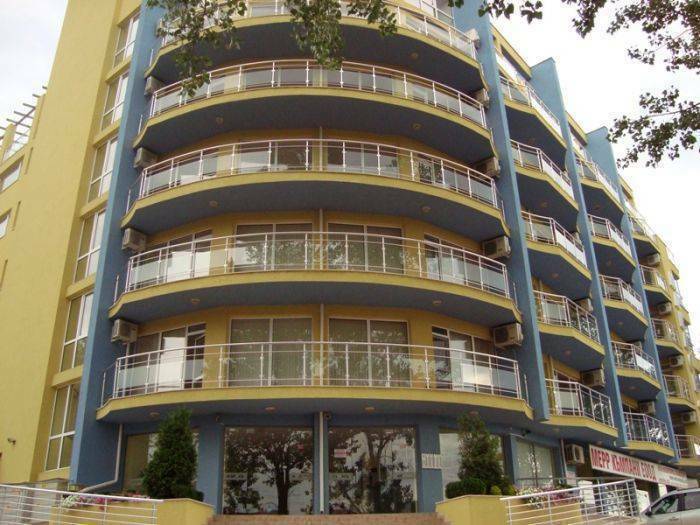 Further amenities include air conditioning, satellite television, and safes. Bicycle rentals on site, Dock nearby, Golf - miniature nearby, Hiking/biking trails nearby, Playground nearby, Running track/path nearby, Sailing nearby, Sco Scuba diving nearby, Snorkeling nearby, Surfing/boogie boarding nearby, Swimming on site, Tennis nearby, Water skiing nearby, Windsurfing nearby oter/Moped Rentals nearby. 1. PROOF OF INDENTITY: The Hotel is only authorized to accommodate properly registered guests. For this purpose, guests are to present their valid national ID or passport to the prevalent hotel employee upon request. The room tariff is not inclusive of any charges for food and beverages or any other services. 2. SETTLEMENT OF BILLS: Bills must be settled on presentation either by payment in cash or valid credit card. CHEQUES ARE NOT ACCEPTED. 3. DEPARTURE: Guests are to use their room for the agreed period. If the period of accommodation is not stipulated in advance, guests are to check out by 12:00 a.m. on the last day of their stay at the latest, and they are obligated to have vacated the room by this time or P50 per hour will be charged for the first 6:00 hours, past 6:00 hours the full amount of one day occupancy will be charged. Check in time if the room is still occupied is approximately 13 noon; if the room is vacant check in time can be earlier. In the event that Hotel has already reserved this room beforehand, and the guest fails to pay attention to requests to vacate the room, or if she/he is not present in the Hotel, the Hotel reserved the right with a three member committee in attendance to catalogue the guests possession and to store them in a safe place so that the room can be used by the guest for whom it has been reserved. 4. MANAGEMENTS LIEN IN VISITORS LUGGAGE & BELONGINGS: In case of default in payment of dues by a guest, the management shall be entitled to a lien on the luggage and belongings and to detain the same and to sell or auction such property at any time after the day of departure, without reference to the party and appropriate the net sale proceeds towards amount due by the guests. 5. GUESTS VALUABLES, CASH, JEWELLERY, ETC. : Visitors are particularly requested to lock the doors of their rooms when going out or when going to bed or when using shower. 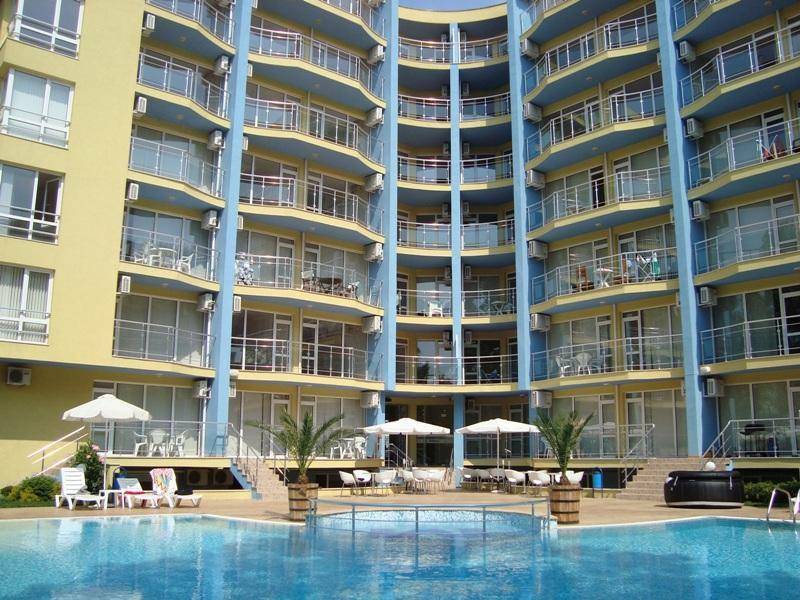 The Hotel will not in any way whatsoever, be responsible for the loss of guests belongings or any other property not entrusted to the management or for damage thereof, whether due to neglect of Hotel employees or Agents or any other cause whatsoever, including theft or pilferage. For the convenience of guests, safes are available in each Apartment. 6. MANAGEMENT RIGHTS: The Management reserves to itself the absolute right of admission to any person in the Hotel premises and to request any guest to vacate his/her room at any moment without any previous notice and without assigning any reason whatsoever and the guest shall be bound to vacate when requested to do so. In default, the management will be entitled to remove the luggage and belongings of the visitor from the room occupied by him/her and lock the room. 7. DAMAGE TO THE PROPERTY: Guests will be held responsible for any loss or damage to the Hotel property caused by themselves, their friends or any person for whom they are responsible. 8. In special cases, the Hotel may offer a guest accommodation other than that which has been arranged, if it does not differ in any essential manner from that which was stipulated in the confirmed booking. 9. The Hotel may offer guests who ask to extend their stay a different room to the one in which they were originally accommodated. 10. Guests may not move furnishings, or interfere with the electrical network or any other installation in the Hotel rooms or on premises of the hotel without the consent of the hotel management. 11. The Bar area is available for receiving visitors. A guest may only receive visitors in his/her room with the consent of the appropriate hotel employee during the period from 9:00a.m. to 10:00 p.m. upon entering this visit in the registration book at the reception area. 12. If the guest becomes ill or injured, the hotel can help the provision of medical assistance or, as the case may be, to arrange for the guest to be taken to hospital, all at the guest expenses. 13. 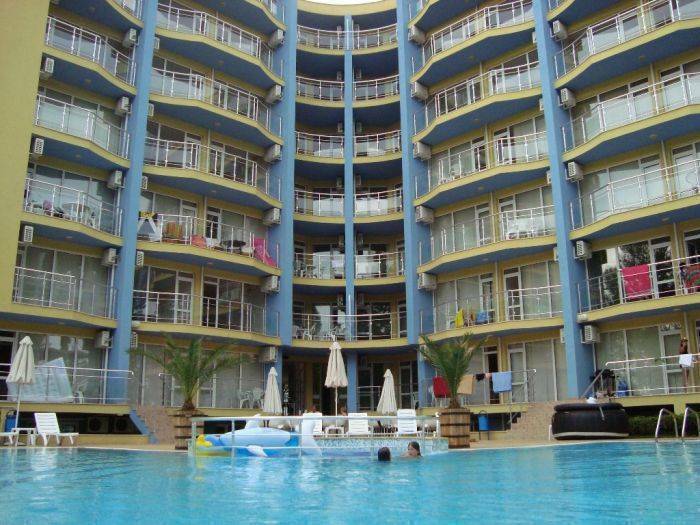 Upon departing, guests are obligated to turn off all water faucets, the lights in the room and its facilities as well the aircon and to shut the door as they leave. Keep your door and windows closed when the aircon is working. 14. Washing of clothes is not allowed in the room, laundry is available in the Hotel, ask reception. 15. The use of WIFI in the Bar area is free of charge for guests only. Use of the lounge chairs on the pool area are free of charge for guests who stay in the hotel only, all others will be charged P20 per day. Use of pool by the guest’s visitor costs P20 per person per day. 16. Dogs and other animals can only be accommodated in the Hotel on the condition that their owner proves that they are healthy and pose no health risk. Noisy animals will be refused. The cost of accommodating animals is billed according to the applicable price list. 17. Guests are to observe nighttime peace and quiet in the room from 10:00 p.m. to 09:00 a.m. i.e. they are not to disturb the other guests accommodated in the hotel. 18. For security reason, it is not appropriate to leave children under 10 years of age without adult supervision in the hotel room or other areas on the hotel premises. 19. Complaints by the guest and any other possible suggestions for improving the hotel activities are welcomed by the hotel management. 20. Guests are obligated to observe the provisions of these Hotel Rules. In the event that a guest is in breach of these rules, the hotel has the right to repudiate the agreement on the provision of accommodation services before the agreed period. 21. Hotel keys must be deposited at the reception desk whenever guests leave the hotel premises and at the time to check-out. It is not permitted to lock hotels rooms with personal locks. 22. HAZARDOUS GOODS: Storing of hazardous goods like raw or exposed cinema films, gas cylinders, cooking stoves, inflammable fuels, firearms, etc, in the hotel premises by guests is strictly prohibited. 23. GOVERNMENT RULES AND REGULATION: Guests are requested to observe government rules and regulations in force from time to time, in respect of registration, alcoholic drinks, firearms, etc. 24. AMEDMENDS OF RULES: The management reserves to itself the rights to add to, to alter and amend any of the above terms, condition and rules.